"We're not about to let you out exploring at nighttime. And even if we did, it's pretty dark out there when the sun's down. We're at the very edge of the galaxy and there's no moon. You wouldn't be likely to see much." The first difference is that there'd be a lot fewer stars in the sky. Here on Earth, we can see about 5,000 to 6,000 stars in a dark sky with the naked eye. The vast majority of these stars are located within a few thousand light years of us, which isn't far compared to the size of the galaxy; we aren't seeing stars from halfway across the galaxy. Now, it turns out that the density of stars decreases as you get farther away from the center of the galaxy, so a planet near the edge of the galaxy (e.g. 40,000 light years out, compared to about 25,000 for the Earth) will have fewer stars in its neighbourhood than we do, to the tune of around 25% of how it is in our neck of the woods. Suddenly the number of stars visible even in the darkest sky drops to no more than 1,500. Other objects directly related to stars like nebulae and clusters like the Pleiades would similarly be more rare. Another object that would look considerably different is the Milky Way, which as observed in the night sky is a faint band of light formed by starlight from the disk of the galaxy. On Earth, that band stretches all the way across the sky, though it is patchy and naked eye visibility varies. Conversely, on a planet at the edge of the galaxy the Milky Way couldn't possibly cover more than about a third of the sky or so. There's simply no galaxy to see in the other directions! It's harder to say, however, whether the Milky Way would be brighter or dimmer than it is on Earth. We see it as quite patchy because dust blocks a lot of the visible light, and the amount and distribution of dust is going to vary from place to place in the galaxy. Apart from the Milky Way itself, there are a few galaxies that are visible from Earth with the naked eye. The brightest are the Magellanic Clouds, two relatively nearby dwarf galaxies (about 160,000 and 200,000 light years away) that are probably in orbit about our own. 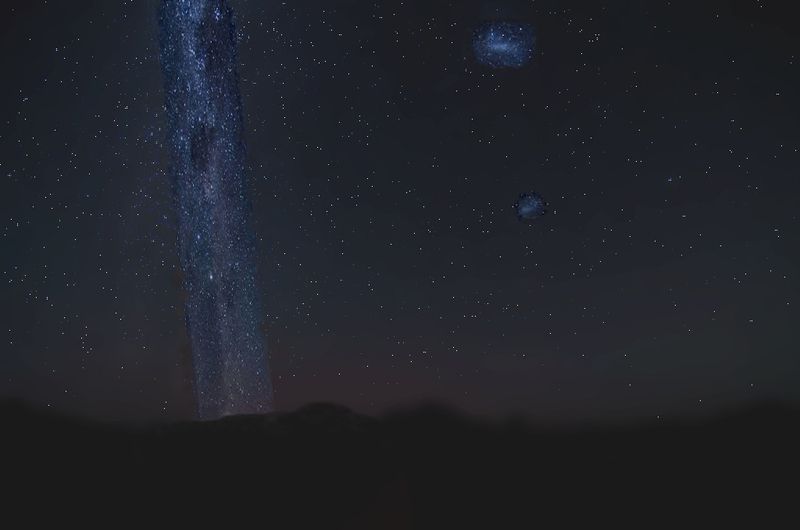 As it happens, the Planet of the Amartos is closer to these galaxies than the Earth is, enough that they might look about 20% larger and 50% brighter. Of course, the other visible galaxies, Andromeda and M33, are millions of light years away, so distant that they'll look basically the same from anywhere in the Milky Way Galaxy. Lastly we'll consider globular clusters, which are groupings of hundreds of thousands or millions of stars, bound by gravity into spherical shapes, contained within the galaxy but not confined to its disk. About four or so globular clusters are visible with the naked eye from Earth, and I expect the numbers would be similar on the Planet of the Amartos. Although they're less common further out in the galaxy, they're also easier to see since they're out of the disk of the galaxy so you don't have to worry about dust obscuring their light. There are even a couple globular clusters, NGC 362 and NGC 1261, that lie halfway between here and there so should look the same from both planets, but unfortunately they're too dim to be seen without binoculars. He has published several other papers on magnetars and high magnetic field pulsars in the Astrophysical Journal, one of the most prestigious journals in the field. Currently, he is working as a data scientist at a major Canadian university (unfortunately, it pays much better and offers more secure employment than astrophysics). Here’s a 2016 update of this earlier blog, which was done in 2014, including some visualizations, using the open source image programing GIMP. We will simplify things, by concentrating on a planet at the edge of the galaxy (40000 light years from the center) in a line extending outwards from a line from Earth to the Milky Way center. How many stars would we see at the edge of the galaxy? What would the stars in the sky look like? First off, stars that are bright from Earth would be at least 10 to15 magnitudes dimmer from the edge of the galaxy, assuming that Earth lay between that planet and the center of the galaxy (you can compute that from the distance-magnitude formula). where Mb is the magnitude of the star as seen at the edge of the galaxy, Ma is the magnitude seen at Earth, dB is the distance to the star from the edge of the galaxy and dA is the distance from Earth. Vega is a very bright (magnitude 0.04) star, as seen from Earth, and lies at about 8 parsecs distance (about 26 light years). From the edge of the galaxy, it would be about a 15th magnitude star, visible only in a powerful telescope. Betelgeuse is a very bright (magnitude 0.41) star, as seen from Earth, at about 160 parsecs (about 520 light years). From the edge of the galaxy, it would be about a 10th magnitude star, probably visible in a very good back yard telescope. So, all naked eye stars visible from the Earth would be invisible to the naked eye from our planet at the edge of the galaxy. In fact, it would require quite a powerful telescope to see even the brightest. None of our constellations and asterisms would therefore be meaningful, both because of dimness and different alignments of stars in the sky. You could forget about recognizing Orion, the Big Dipper, or any of the others. But, of course, there would be other stars in the sky, though as Scott noted, they would be much less numerous, only 25% as many as in the region of Earth, or even less. The mix of stars (brightness, colour, size) might also be different, depending on the relative distances of our edge planet to the more active star forming regions of the galaxy (the spiral arms), compared to Earth. But let’s assume that the mix of stars in the local region is similar to what we find from Earth, there are just a lot fewer of them. So, whereas there are about 16 first magnitude stars visible from Earth, there would only be four visible from the Planet of the Amartos (i.e. 25% of 16 is 4). Similarly, there are about 30 second magnitude stars visible from Earth, so we might expect about 7or 8 at the edge of the galaxy. Of course, that would depend on where the planet was in its orbit when a person was looking at the night sky (towards the center of the galaxy or away from it), the tilt of the planet relative to the plane of the galaxy and what hemisphere one was looking from. Similarly for stars of higher magnitude (i.e. dimmer). Of course, how many stars one would see from the Earth or from the edge of the galaxy is not simply a matter of the stars, but of the person as well. As we all know, people’s night vision varies – different people have different dark adaptation abilities, and that can also vary for a given individual with age, their state of health, and so forth. For this purpose, we will assume that we are referring to someone with excellent night vision. Below is an attempt to capture that effect, using a dark sky photo from Australia (which includes the Magellanic clouds and the Milky Way). To simulate the effect of a sky having 25% as many stars, I applied a GIMP filter twice, which removes every other line in the image (so 50% times 50% = 25%). The downside to this method, is that it leaves a slight impression of looking through a screen door window. So, to diminish that effect, I applied a Gaussian Blur. I also found that I had to increase the brightness and contrast, otherwise the picture was just too dark to be meaningful. As you can see, the effect is to knock a lot of stars out the sky, as seen from the edge of the galaxy. What would the Milky Way and the Magellanic Clouds look like from the edge of the galaxy? The Milky Way has a relatively low surface brightness. Its visibility can be greatly reduced by background light such as light pollution or stray light from the Moon. 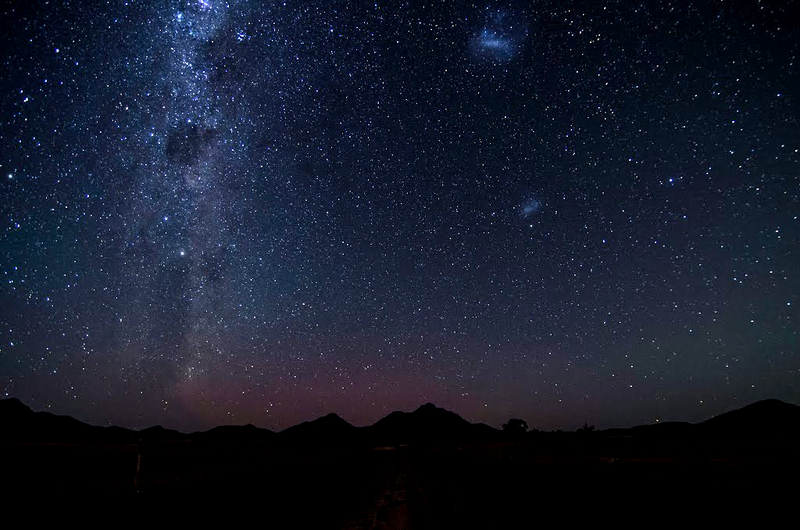 The sky needs to be darker than about 20.2 magnitude per square arc-second in order for the Milky Way to be seen. It should be visible when the limiting magnitude is approximately +5.1 or better and shows a great deal of detail at +6.1. This makes the Milky Way difficult to see from any brightly lit urban or suburban location, but very prominent when viewed from a rural area when the Moon is below the horizon. [nb 2] The new world atlas of artificial night sky brightness shows that more than one third of Earth population cannot see the Milky Way from their homes due to light pollution. 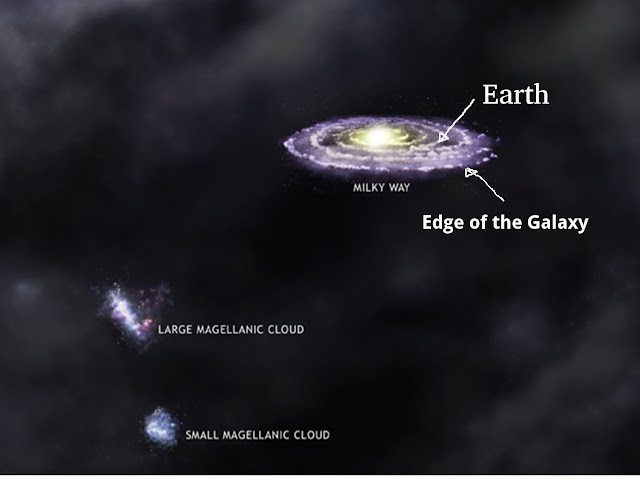 So, from the edge of the galaxy, the Milky Way should appear smaller than it does from Earth, but its apparent brightness wouldn’t necessarily change. The amount of luminosity would go down as 1/R**2, but so would the surface area over which that light is spread out. Therefore, when looking directly at the Milky Way, it should seem as bright as it does from the Earth, but smaller, in proportion to the additional distance. However, there would be more interstellar dust to go through, so that might actually make the galaxy somewhat dimmer in appearance. Since our sky picture only captures a portion of the Milky Way from Earth, we will keep it the same in length, but reduce it in width (to about two thirds of its original width, reflecting the fact that we are seeing it from about 50% farther away than from the Earth. To do that, I cut out the Milky Way in the photo, created a layer, and shrunk the width of that accordingly. I also dimmed it a bit, to ensure that the surface brightness stayed about the same. Then I filled in the gap with background stars borrowed from the rest of the photo. 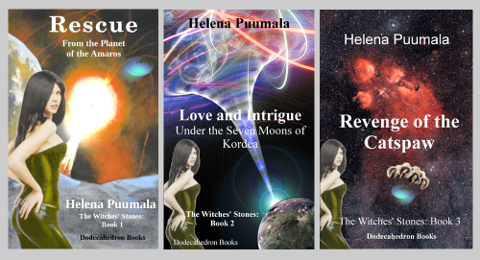 As for the Magellanic clouds, we are actually getting closer to them, as we go from Earth to a planet on the edge of the galaxy, so they should appear a bit larger in the sky than they do from Earth. We can make some rough estimates, using elementary trigonometry. Given that the distance to the Large Magellanic Cloud drops from about 50 Kiloparsecs (or about 160,000 light years) to about 46 Kiloparsecs (or about 148,000 light years), and is 4.3 Kiloparsecs in diameter, it should subtend about a half degree greater angle. This is just based on some elementary trigonometry. So, we will increase its diameter in our photograph by about 10%. Similarly for the Small Magellanic Cloud, which is somewhat farther away (about 200,000 light years). Below, then is my simulated view of the sky from the edge of the galaxy, showing the reduction in stars and the likely changed appearance of the Milky Way and Magellanic Clouds. Note that it assumes that the Magellanic Clouds are in the same view as the Milky Way, looking back towards the center of the galaxy. Technically, they should probably be on the other side of the sky entirely, given how the planet's position in the galaxy has been conceived, but it would take up too much time and space to produce two separate pictures. Note also, that this is only a first-level attempt at getting such a picture right. Clearly, one could spend some more time on the view from the edge of the galaxy, to really clean things up (e.g. feather in the boundary between the Milky Way and surrounding space, so that they blend in better). Furthermore, one could consider some of the astrophysical differences between being located in the "suburbs" of the galaxy, as Earth is, versus the exurbs, as a planet on the edge of the galaxy would be. Some key issues might include proximity to star formation regions (e.g. spiral arms), differential density of interstellar matter such as dust lanes, and whether the dark matter halo might play some role in the appearance of the night sky, as it appears from Earth versus the outer parts of the Milky Way. And here’s the two views, side by side, for easier comparison.